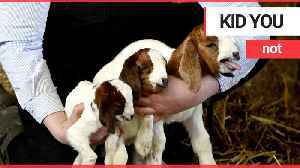 These adorable pictures show a litter of &apos;exceptionally rare&apos; goat triplets bounding around just days after they were born. 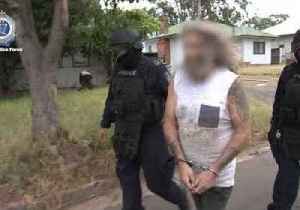 The yet unnamed kids, two of which are male, were birthed..
Police seized about 900 grams of methylamphetamine, worth $122,000, and charged four people during a raid on a property in Penrith, New South Wales, on February 27.This video, filmed by police, shows a..
Cronulla are hopeful of having Andrew Fifita and Paul Gallen against Penrith on Thursday despite the pair battling injury issues. Andrew Fifita is a chance of overcoming a hamstring injury to face Penrith on Thursday night, after being named in Cronulla's NRL side. James Tamou will rise out of Penrith's leadership group as the club's NRL captain for the rest of the 2019 season. Cronulla could be without prop Andrew Fifita for their next NRL clash with Penrith because of a hamstring injury. Penrith coach Ivan Cleary has plenty of concerns after his side missed a chance to keep Gold Coast winless on Friday night. James Maloney admits Penrith's attack must improve if they are to play finals football again this season. Panthers supremo Phil Gould reveals on 100% Footy that Penrith's golden-point win against Wests Tigers could have gone very differently if not for Nathan Cleary's work ethic. Penrith's Dallin Watene-Zelezniak is poised to be shifted to fullback for their NRL away game against Gold Coast. They were down and out with barely a minute to play but Nathan Cleary's boot inspired Penrith to a one-point win to cap a week of drama for his family. Nathan Cleary has kicked a golden point field goal to give Penrith a 9-8 victory over the Wests Tigers on Friday. Penrith coach Ivan Cleary has defended son Nathan's slow start to the NRL season ahead of their match against the Wests Tigers. Penrith coach Ivan Cleary has finally opened up on his walkout at the Wests Tigers to return to his former NRL club. Cameron Munster has scored a new nickname from his Storm teammates after recording three steals in last week's win over Penrith, but he's not buying anyone naming him favourite for the Dally M.
Penrith back-rower Viliame Kikau is set to test out returning Wests Tigers playmaker Josh Reynolds in what will be his first NRL game in nine months. For the briefest of moments, it appeared Wayne Bennett could be heading to Penrith. But the veteran coach is content with how the coaching carousel played out. Benji Marshall is likely to miss the Wests Tigers' NRL game against Penrith with a hamstring strain with Josh Reynolds to receive a call up. Moses Mbye says he understands why some of his Wests Tigers teammates would harbour ill feeling toward Penrith coach Ivan Cleary after his NRL defection.